E.F.S. was founded in 1999 by Michelle Nicolaides in Temecula, CA. Michelle had a dream to own her own business. She has extensive management and retail experience. 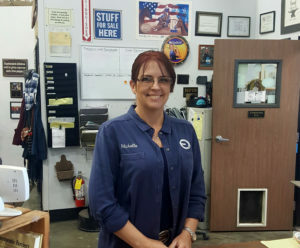 In 1995 Michelle started managing a farrier supply store and fell in love with the business. That was it! She spent years saving every penny that she could put together and went in search of a location in need of a horseshoeing supply store. All investigations pointed to Temecula with its’ centrally, freeway close location between 4 counties. She started with a small inventory and worked hard to build relationships. She studied day and night to gain practical knowledge of the products, learning from many successful farriers and other supply shop owners. The horseshoers’ were eager for a supplier to give them service, selection, and convenience. Over time she was able to build those bonds with her customers and manufacturers, never taking for granted the place that she had made for herself. Today’s market has so much to offer and times have progressed with the internet and a flood of new product choices, but Michelle continues to learn as much as possible about every product in her store as well as what is new on the market and upcoming events in the industry. Today and always, Michelle and her team make a point of ensuring that each customer is treated with respect and kindness. She works hard to be an indispensable asset to her clients’ businesses. Whether you shop online or in the store, Honesty, Ethics, and Integrity are number one for Empire Farrier Supply.